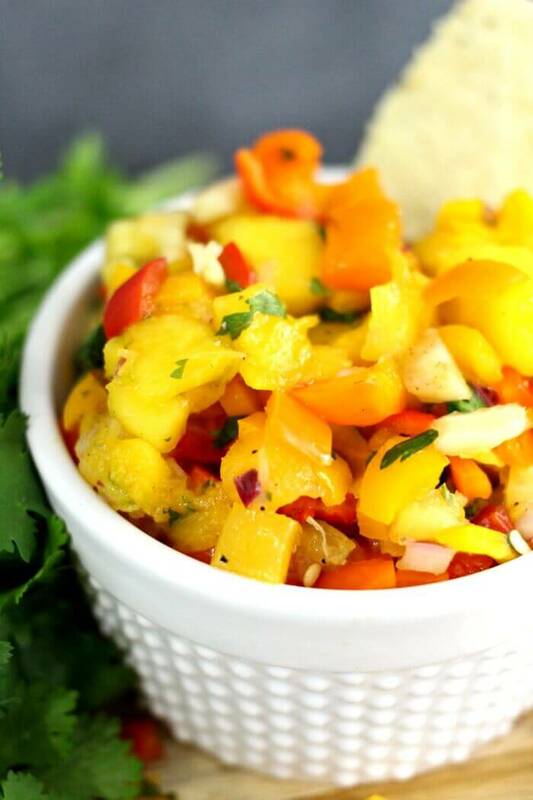 I don’t care if it’s the dead of winter where you are, make this delicious Mango Salsa and you’ll be instantly transported to the tropical Caribbean! Mango Salsa is where my mind is at. Even though it doesn’t get too cold in my neck of the woods, I like to have a taste of the tropics! 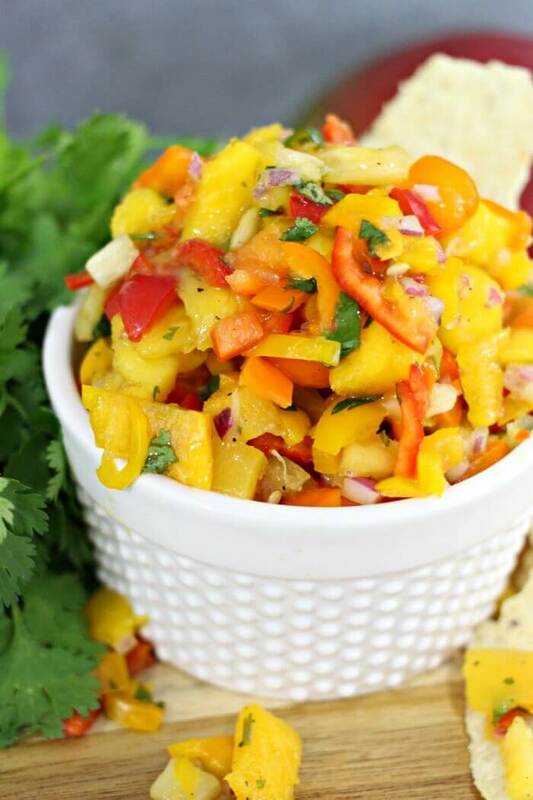 In my opinion, everyone should have an easy mango salsa recipe in their repertoire! 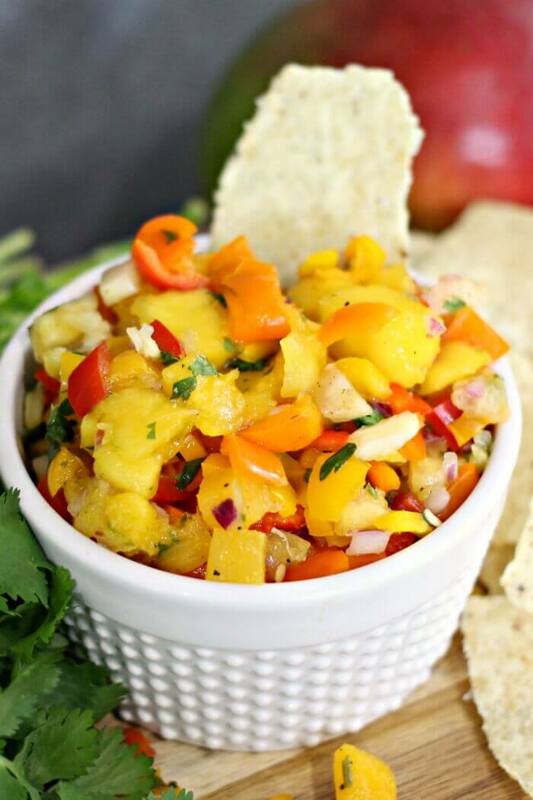 If you’re looking for a bright spot in your day, this Mango Salsa recipe is surely the cure to your afternoon slump. Whether you’re eating it with a bag of tortilla chips or popping it on top of some baked chicken or fish tacos, our tropical salsa is the cure. 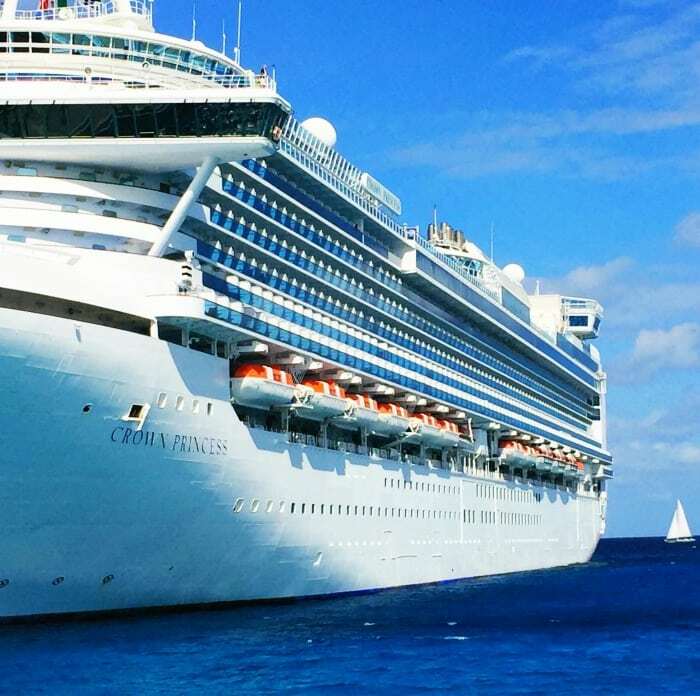 I am so lucky to have partnered with Princess Cruises for this post. Mango – Be careful when slicing mangos. They can be very slippery! Red Onion – Why don’t they call this purple onion? Anyway, chop it up for some color and zing. Cilantro – If you don’t like cilantro, I’m sad for you. But go ahead and skip it. I’d rather you have a cilantro-free Mango Pineapple Salsa, than no Mango Pineapple Salsa at all. That would be nearly criminal. Or at least more than regular sad. Should you choose to pass on the cilantro, I’d like to suggest using a little bit of green bell pepper in the recipe to bring that color and vibrancy back in. It’s just not the tropics without a little green. Jalapeno – Totally optional, but nice if you like a little heat. The amount we include does not make this spicy at all – add more to suit your tastes. Lime – Fresh lime juice makes everything taste tropical! Salt and Pepper – To taste – definitely don’t skip the salt, it enhances all the flavors. First, chop all ingredients – I like them small enough to fit easily on a chip. Then, mix them in a bowl. I find that the flavor is best if you let it sit in the fridge for a few hours before serving. Finally, serve as a dip or a topping! 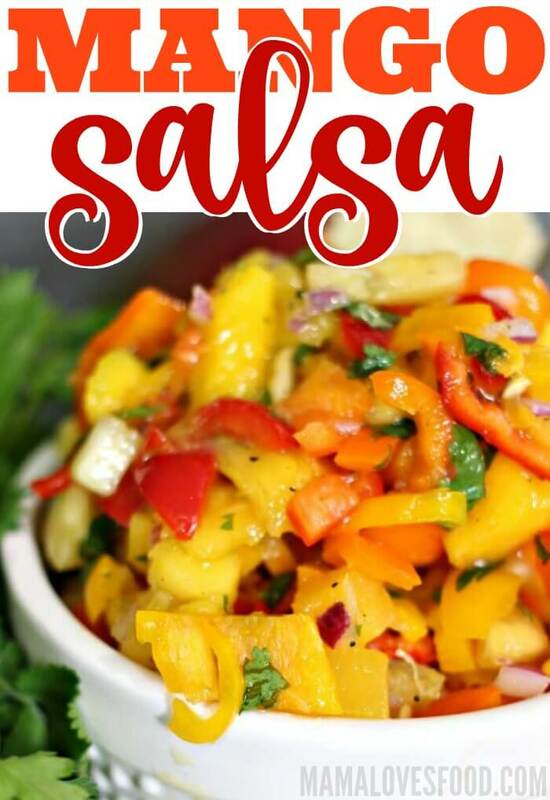 Mango salsa is amazing on its own (with chips) or coconut shrimp – on baked chicken, with fish tacos, even mixed into your guacamole for a little added kick! You could also use it instead of strawberries in our Strawberry Spinach Salad! You can make mango salsa ahead of time. Keep it in the refrigerator until ready to serve. I actually find the flavors are even better the next day. 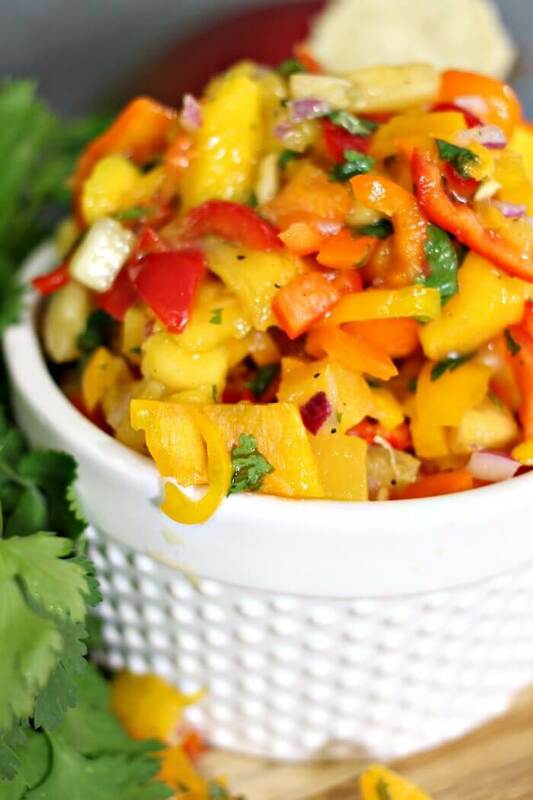 You can keep mango salsa in the refrigerator for up to 3 days. Make sure it’s in a sealed container. After three days the salsa may still be edible, but it will have lost it’s texture and crunch. 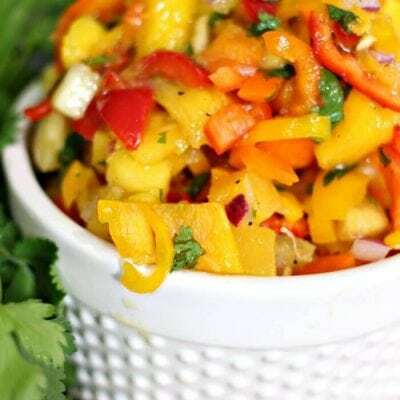 Mango Salsa is very healthy, as it is chock full of veggies and fruits which contain vitamins, minerals, fiber, and antioxidants all of which are important to a healthy diet. Mango Salsa is not keto compliant. Although it is full of fruits and veggies, mangoes are fairly high in sugar. Most people on a keto diet try to stay below 25g of carbs daily. A 1 cup serving of mango has about 22g of sugar. 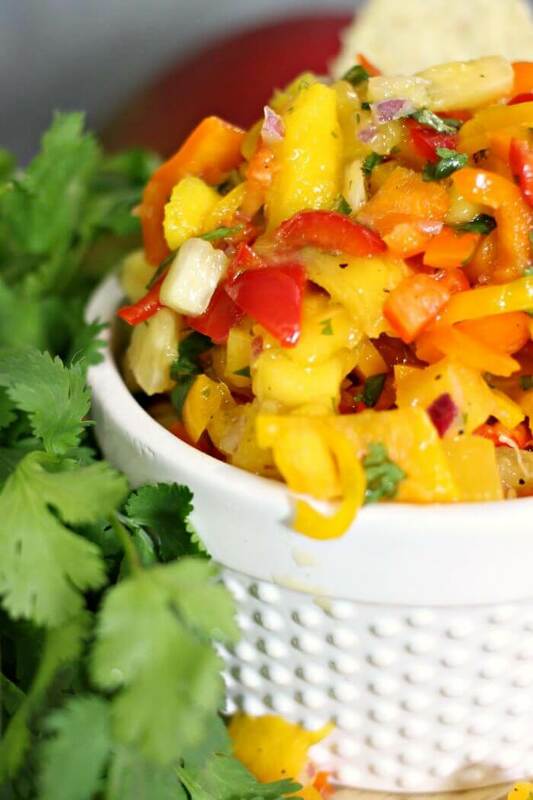 Yes, you can substitute other fruits in a mango salsa. Well, not mango, because then it wouldn’t be mango salsa. Adding some slice peaches would be nice, but the beauty of fresh salsas is that you can add almost any in season fruit or veg! Really, experiment to find the combinations you like best. 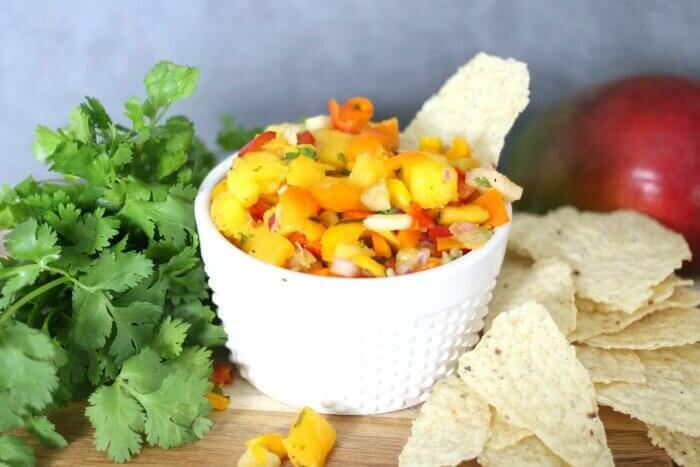 Yes, you can freeze mango salsa, but the consistency of the salsa will be less firm and more watery once thawed. You can keep in freezer for up to 3 months. Whole Fruit Popsicles – Also inspired by those life changing pineapples, these delicious whole fruit popsicles are light, refreshing, and have no added sugar! Mango Smoothie – This is such a treat after a hot afternoon bike ride or if you want a quick breakfast substitute. Mango and orange with the smoothness of vanilla is the perfect combo. Cilantro Garlic Sauce – Ohhhhh, cilantro garlic sauce is about to be your new obsession. We started by putting it on tacos, but now I like it on everything from fries to salads! Pickled Onions – Last week in Cozumel I was reminded how much I love pickled red onions on pork, so of course I came home and made some right away. Pico de Gallo – Fresh tomatoes, onion, lime, ahhhhhhh. I could just eat this with a spoon! Pineapple Margaritas – So refreshing! 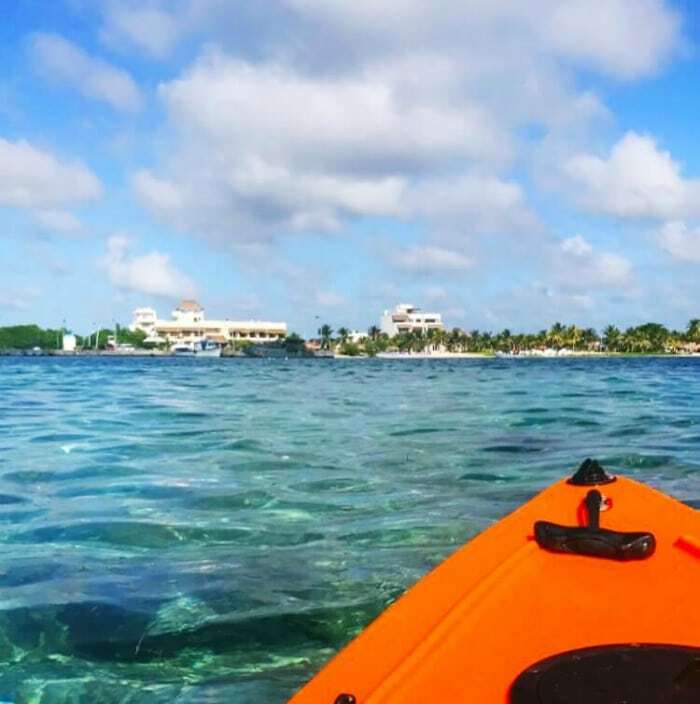 If you love travel posts, be sure to check out these from our last tropical adventure! Visiting Aruba with Princess Cruises– In Aruba we hopped on a Jeep tour and buzzed around the island all day, stopping at the famous land bridge, the oldest church on the island, and the lighthouse among other beautiful places! Visiting Cartagena Colombia with Princess Cruises– Cartagena was a visit to the old city a Spanish built city full of color and history. Visiting Limon Costa Rica with Princess Cruises – In Limon we did a jungle cruise followed by a trip up the mountain to a private sanctuary where we saw a gorgeous waterfall and rode on a a gondola high in the tree tops. Visiting Ocho Rios Jamaica with Princess Cruises– Ocho Rios had us climbing a waterfall! Visiting the Panama Canal and Old Panama City with Princess Cruises– Early in the morning we went through the first of the famous Panama Canal locks, and then we disembarked to enjoy the beautiful Old Panama City for the afternoon. I must go back to Costa Rica and try this salsa! And I’m so thankful the Caribbean is open for travel because BABY SLOTHS! 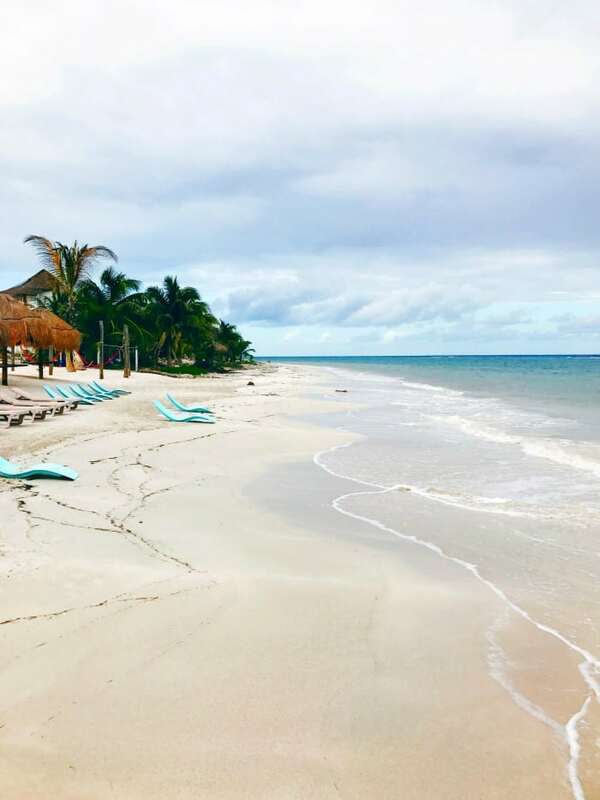 I want to eat this salsa, sip on a margarita and hang out with you on the beach in the Caribbean! Love Princess and everything about what they are doing to help! 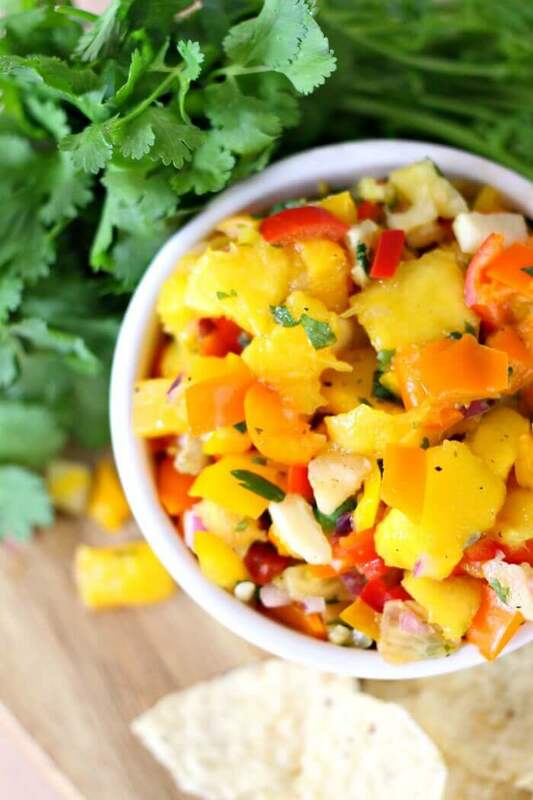 I absolutely adore mango and pineapple salsa and thankfully I love cilantro too! I would be eating this by the bowl if I could! I have definitely done that! Bet this would be delicious with ham–just in time for Easter. Yes! So good on top of grilled ham steaks. YUM!